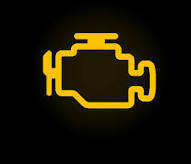 Engine Temperature Warning Light is on. The Engine Temperature Warning Light is on, it looks like a pirate ship with it's sails down or it could be a picture of an engine or show a red thermometer. If the engine temperature warning system, either by gauge, light, or message, signals that the engine is overheating, turn the cabin heater to the maximum heat range and set the blower motor to high. Turn off the A/C and any other nonessential systems that are running, including the radio. This is to alleviate as much load from the engine as possible and to circulate the remaining coolant through the maximum amount of heat transfer surfaces, like the radiator and heater core. Following these steps will release as much heat as possible. Pull the vehicle over to the closest and safest place on the side of the road. DO NOT open the hood for at least 20 to 30 minutes. A severely overheating engine can rupture a radiator hose and/or shoot coolant steam out of the coolant expansion tank or radiator cap and severely burn and even blind a person. While waiting, call a tow truck and have the vehicle towed to a qualified repair shop for a complete cooling system inspection and diagnosis.